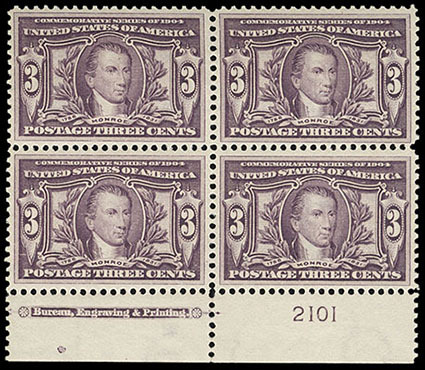 1904, 3¢ Louisiana Purchase, bottom margin plate no "2101" block of 4 with imprint, o.g., never hinged, exceptional centering, bright and fresh with rich vibrant color, Extremely Fine and choice; with 1999 P.F. certificate. 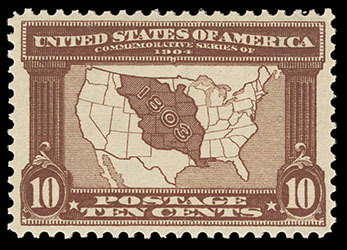 1904, 10¢ Louisiana Purchase, in the very scarce dark red brown shade, o.g., never hinged, choice centering within wide margins, deep color, Extremely Fine; with 2000 P.F. certificate for block. 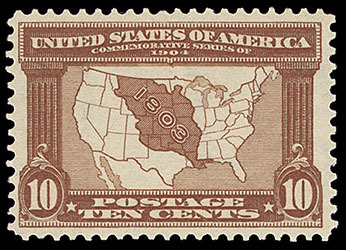 1904, 10¢ Louisiana Purchase, o.g., never hinged, wide margins, rich color and remarkably fresh, Very Fine and choice; with 2007 P.S.E. certificate.